The protestors arrived at the Lexington office in hopes of handing off some letters to the senator’s staff about the government shutdown, said Chon Jung, an organizer. Jung said it was a “peaceful demonstration” though some protesters banged on windows of the office. He said protesters agreed to leave the building when police arrived. McConnell was in Washington on Wednesday. Lexington police spokeswoman Brenna Angel said about 50 protesters and media left without incident. 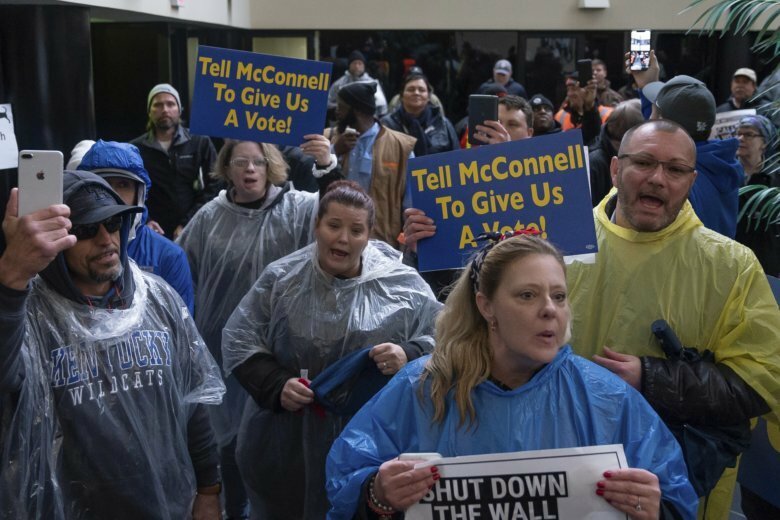 Jung, a retired law enforcement officer, said workers were at the office to “put some pressure on McConnell” to pass legislation to end the shutdown. He said workers are feeling the pain of the shutdown that has dragged on for over a month. “They’re hurting,” Jung said by phone from outside the field office. The American Federation of Government Employees organized the protest to “highlight the effect this shutdown is having on our members, their families, and the nation,” according to a statement. Workers from the Transportation Security Administration, the Department of Interior, the Census Bureau, and the Department of Veterans Affairs took part in Wednesday’s protest. The U.S. Senate this week is set to vote on dueling proposals — a Republican one that would give Trump money for the wall and one from Democrats that would re-open government through Feb. 8, with no wall money, giving lawmakers time to talk about it.